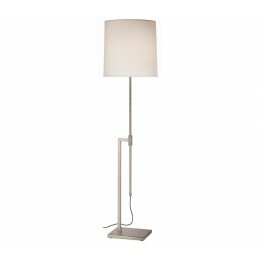 Palo Floor Lamp is a classic of mid-century modern design, with minimal, clean lines. This transitional look has a vertical stem held in the grasp of a crisp right-angle stem for unique vertical adjustability. A linen drum shade illuminates from the top. 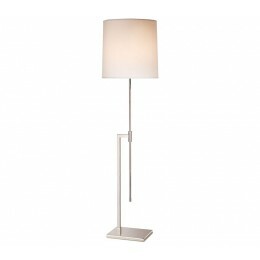 Offered in satin brass with an off-white linen shade. 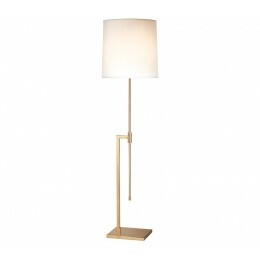 The Sonneman 7008.38 Palo collection Floor Lamps in Satin Brass use Incandescent light output and bring Modern style. 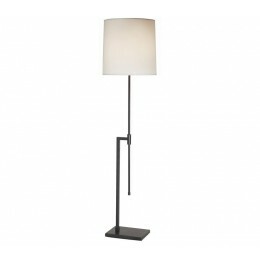 This item is 47"H x 14"W. The wattage is 150. The Sonneman 7008.38 requires 1 bulb (not included). Additional Information: Shade-Satin Brass Shade; Control-3-Way Turn Switch.